There are many ideas for basement walls finishing and the first thing that comes to mind for most people is drywall, but that doesn’t have to be the case. 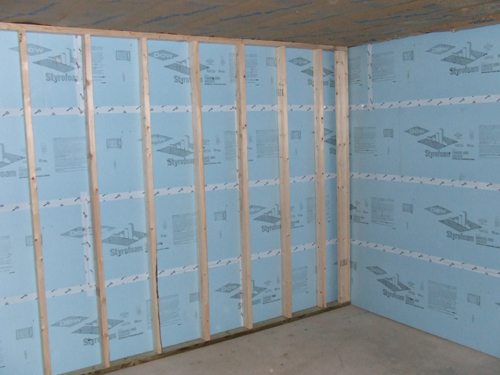 You don’t have to spend a day or two framing out your basement walls. You really don’t have to spend hours and hours hanging drywall and plastering and sanding. You can finish the concrete like it is, which you will find not only easier but also economical. You might consider finishing the concrete the way it is and have walls in your basement that stands out and really looks unique. Staining is one way to finish your walls and change them from looking dull to looking beautiful. There are two types of concrete staining, which are acid and acrylic. The acid stain seems to be the more popular choice. If you find your concrete has too many defects to deal with, then it is better to use the acrylic. If you use acid stain on a wall that has defects, it will only show these defects worse than what they are. There is also another potential problem and that is if the concrete is old it may not have the ability to react to the acid stain due to the free lime that is needed to accept this type of stain. There are a few more benefits to using acrylic stain, the biggest of these being the array of colors that it comes in. This gives you an endless option of color schemes and patterns where acid is only available in tones of browns, blues and reds. When you use the acrylic, you will get a much better outcome of appearance of your walls due to the acrylic being more like dyes and help the cosmetic defects that you will come across ion your concrete.